I am happy to be co-hosting this blog hop with Savannah from Hammock Tracks and Paula from Call Me PMC. Each week we have a theme. This week it is Fish and Shrimp. This week is pushing me outside my comfort zone. I am not a lover of fish. You probably have noticed a deficit of those recipes on this site. My son did some good tacos. He really likes them. If someone else cooks it, I might be tempted to try it. I do my token salmon fillet or croquettes on occasion. I would eat chicken 10 times before fish. So here goes. I was surprised at how good this was. If you are a foodie blogger share your favorite seafood dish with us this week. If you are a food creator and looking to make something fresh from the sea find your favorite recipes, and create your grocery list before you head out to the store. 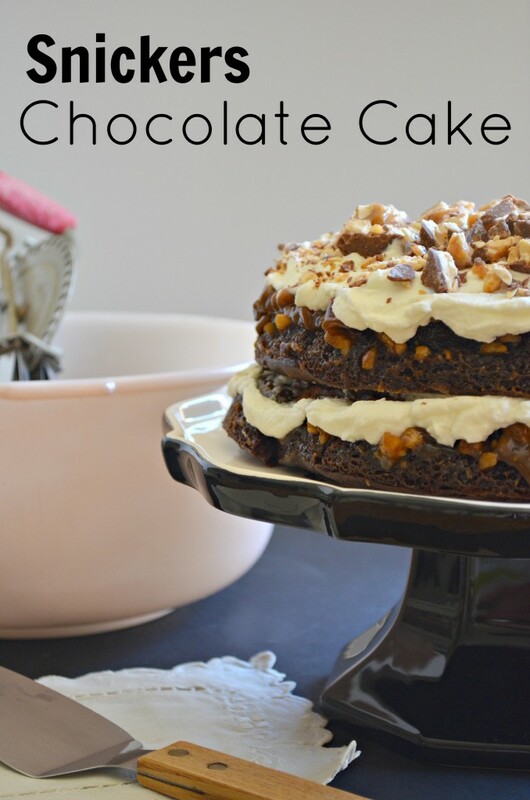 My featured blog for this week is: Real Housemoms and their awesome looking Snickers Chocolate Cake. I love Snickers and cake and I love the Real Housemoms too. They always have something delicious to eat at their site. A perfect post to share with Slightly Indulgent Tuesday’s! All three of my children cook. They have their specialties and each has their favorites with their own twists. My son has taken to cooking recently. Healthy cooking at that! This is a big change for him. He was eating out A LOT and it wasn’t healthy. He’s the baby of the family, but all grown up. My two girls make delicious things too. They aren’t too much into baking. Amy makes great party food and Krista is very creative with herbs and chile. I think this food blog is rubbing off on him. He sends me some pictures of what he cooked for dinner and then immediately calls me to describe what it was he made for dinner. When he calls it is usually around 900PM and I’m not prepared to write down all the ingredients. He is into fish. You will notice there are not too many (if any) recipes that use fish from me. This is new for us all. He didn’t learn to cook fish from me. He made fish tacos because someone gave him some homegrown peppers at work. That spurred him on to combine the peppers, cilantro, onion together in a skillet and sauté them. He rubbed tilapia with red chile powder, salt, pepper and a seasoning blend and warmed his whole wheat tortillas in a skillet. Then he topped the grilled tilapia with the sautéd pepper mix, added an avocado and some lime juice. I do believe he has great promise as a home cook. He didn’t know what kinds of peppers they were, but they were HOT! They look good. Another evening he made a great steak and sent me that picture. He uses a George Foreman table top grill that he loves. I think this steak was marinated in Worcestershire sauce, salt, pepper and a dry steak seasoning blend. He marinated this overnight because he decided not to cook one night. So it was well marinated when he cooked it. He served it with asparagus and mushrooms he sautéed in butter. Looks pretty good to me. When he lived at home he made chicken breasts marinated in Italian salad dressing or he fried flautas. They were a mess and guess who did the dishes? Now he cooks things that don’t make a mess as he has to clean them up himself. At least he is thinking healthy and that is way ahead of when I started thinking of eating healthy food. Good idea for us all! We continue with our 2012 Olympic food challenge in Italy. I like (love) Italian food. Whenever I can’t think of anything to eat, Italian is the second thing that comes to mind – Mexican food being the first. On my bucket list is a trip to Tuscany. The scenery and the food and the art sound like my sort of place. In the meantime I learn a little about Italy, listen to opera, and eat Italian when I can. A new Italian Bistro is opening in my neighborhood. I plan to sample a few dishes. Red Mountain – can’t wait, Chef Jason. A little bit of Olympic information concerning the Italians including their flag. The flag is of course important to every nation. Italy’s flag design was inspired by that of the French flag which was brought to Italy by Napoleon in 1797. The colors are those of Milan – red and white – combined with the green uniform color of the Milanese civic guard. They have earned 522 medals with 190 Gold, 158 Silver and 174 Bronze. Italians are champion fencers but also pick up medals in cycling and athletics. The cuisine in Italy as well as the wines are different from the North to the South and the east and west coasts. Northern Italy has polenta in place of a lot of the pasta, fish is important in that region as well as beef, veal, and pork. Southern cuisine focus is on pasta, tomatoes, rich dark green vegetables, cheese, lamb, seafood and herbs. Where did lasagna originate? Italy, of course. Not so! Lasagna originated in Etheopia. The Italians attempted to take over Etheopia, but they failed. The one thing they did take away from Etheopia and began to call their own is Lasagna. True story!! I’m glad to know that little bit of history because every Italian restaurant I eat in has lasagna on the menu and it is my favorite. I love the Bechamel sauce, cheeses and marinara sauce combo. It is rich, spicy and so comforting. These roll ups have all the flavor combinations I like, but are a quick meal to prepare and serve your family or a group watching the games. Serve this with a huge bowl of salad and some Espresso ice cream with Amoretti cookies crumbled on the top is a great meal. To make the sauce: Melt the butter in a heavy medium saucepan over medium-low heat. Add the flour and whisk for 3 minutes. Whisk in the milk. Increase the heat to medium-high. Whisk the sauce until it comes to a simmer and is thick and smooth, about 3 minutes. Whisk the salt, pepper, and nutmeg into the Bechamel sauce. Set aside. I used an egg slicer to slice the mushrooms. I remove the stems and slice in one direction. Then carefully holding the mushroom together I turn it 90 degrees and slice it the other direction. A quick run of the knife through them is the perfect size for this roll. Butter a glass baking dish large enough to place the rolls. (9X13”) Pour the Bechamel sauce over the bottom of the prepared dish. Lay out the lasagna noodles on a work surface, then spread a large spoonful (about 3 tablespoons worth) of ricotta mixture evenly over each noodle. (had to use my fingers to get this spread evenly) Starting at 1 end, roll each noodle like a jelly roll. Lay the lasagna rolls seam side down, without touching, atop the Bechamel sauce in the dish. Repeat with the remaining noodles and ricotta mixture. Spoon some marinara sauce over the lasagna rolls. Sprinkle the mozzarella and remaining 2 tablespoons of Parmesan over the lasagna rolls. Cover tightly with foil. Bake until heated through and the sauce bubbles, about 20 minutes. Uncover and bake until the cheese on top becomes golden, about 15 minutes longer. Let stand for 10 minutes. Meanwhile, heat the remaining marinara sauce in a heavy small saucepan over medium heat until hot, and serve alongside. *I make my own sauce and it has been featured previously as Spicy Spaghetti Sauce on this blog. I use this for almost every red Italian sauce I cook. I always have some in the freezer ready to use at an insane “craving Italian” moment. Now make your own Italian dinner and celebrate the Olympics. Clairee – Don’t give these all to me! Ouiser – Somebody’s gotta take em. I hate em. I try not to eat healthy food if I can possibly help it. The sooner my body gives out the better off I’ll be… I can’t get enough grease into my diet. Anelle – Then why do you grow them? Ouiser – Because I’m an old Southern woman and we’re supposed to wear funny looking hats and ugly clothes and grow vegetables in the dirt. Don’t ask me those questions. I don’t know why, I don’t make the rules! Ain’t that true? And what do I have? Tomatoes. So, today’s post is about tomatoes. I was trying to think of something different. What could I do with big tomatoes? Stuff them of course! How boring would another chicken or tuna salad be though? Here is my attempt at creative thinking. This was filling and tasty with the added bonus of leaving the kitchen nice and cool on a hot summer’s day. Don’t worry if you aren’t old enough to grow tomatoes this big. The grocery store has a fabulous selection right now. In a medium bowl combine artichokes, mushrooms, onion , pepper, croutons, bacon, cheese, parsley and dressing. Stir to coat and chill in the refrigerator for about an hour. While the other ingredients mingle slice off the top and scoop out the inside of your big tomatoes. I used a knife to cut out a big chunk and then I used my melon baller to get all the way through the seeds. After an hour pack the stuffing into the two tomatoes and serve. I thoroughly enjoyed this! Some of the rules serve a good purpose, Ouiser. I’ll have to watch that movie again soon. I am dusting this one off for This Week’s Cravings on July 30th! Today’s fresh vegetable feature is Portabello Mushroom Pizza. What I love is picking almost all the stuff that goes with this meal from the garden. I literally just bought the mozzarella cheese and mushrooms for dinner tonight. You may be aware that I am a very low carb eater. This dish makes me feel like I am eating lasagna and I don’t even miss the pasta. I started by getting my already made pizza sauce from my first crop of tomatoes out of the freezer to defrost, then I grabbed my biggest bowl possible and headed out to the garden. What a sight! All of the dirt digging and bug fighting is worth it. I picked lettuce, dill (I love a little fresh dill in my field greens), tomato and cucumber for a salad and grabbed some fresh basil for garnish. I quickly snipped a few early okra and pulled up the last of my onions. I did a thorough bug check on the tomato plants, then I hurried back to the air conditioning. No way was I going back out into that heat today. Grill pan it is! Pre-heat the grill pan over medium high heat and baste with olive oil. Gently pull out the mushroom stems and scoop the gills from the inside of the mushroom using a spoon. Slather the mushrooms with olive oil and place face down on the grill pan. Cook for 5-6 minutes or until the mushrooms are starting to flatten as the moisture cooks off. Flip and cook for another 5 minutes to lightly char the top of the mushroom. Flip one more time for just a minute to cook off the last of the moisture. Remove from grill pan and place top-side down on a baking sheet or broiler pan. Assemble the “pizza” by topping each mushroom with two tablespoons of sauce and a slice or 1/3 cup of mozzarella cheese. Then slip into the oven and broil until cheese is golden and bubbly. Top with torn basil to garnish and serve. A friend at work, Nelda and I were discussing how the Food Network has influenced our cooking style. I think it has improved my cooking and it has certainly made me more aware of how I can improve the flavor by using broth and fresh herbs and olive oil. When I learned to cook with my mom, we didn’t use those at all. She had 4 children to feed and the budget didn’t include all the extras. Salt and pepper and maybe a dried bay leaf were her flavor enhancers. She made good food though. As time went by she began to venture out to try more and different things. I cleaned out her kitchen when she moved, her spice cabinet was still pretty basic. There were more flavorings she added to cookies, cakes and pies than there were for savory dishes. I was reading a food blog and there was a discussion about plain home cooked food and nothing would do but I was going to have a pork chop and rice dish. I always stop at that thought because of all the salt in canned food. I decided if I can make my own Suiza sauce for green chicken enchiladas, I can make my own cream of mushroom soup. It was pretty good and satisfied my need for a good casserole. Heat the oil and butter in a non-stick skillet until butter has melted. Add the mushrooms and shallot and add some salt and pepper. Cook until mushrooms and shallot are soft. Add the flour and cook for about 2 minutes. (Adjust the liquid you add depending on how thick you want your sauce.) Using a whisk add the broth and milk and stir until bubbly and slightly thickened. At this point I use it as I would canned cream of mushroom soup (no need to dilute). I know and can pronounce all my ingredients. Brown your pork chops (I like thin cut ones.) in a small amount of oil in a non-stick skillet. Let them brown on both sides with a light sprinkle of salt and pepper. Remove to a prepared oven-proof dish. I used the same skillet for the sauce as I browned the pork chops in, and sautéed the mushrooms and shallot in the oil and just added a bit of oil and the butter to melt before adding the mushrooms and shallot. Sprinkle about ½ cup white rice over the pork chops and add the sauce. Cover the baking dish with foil and bake at 350° for about 40 minutes or until the rice is tender. I served this with steamed cabbage and a small plate with radishes and onions from my garden.